The Rotring Tikky Rollerpoint is an amazing pen, but even amazing pens are not for everyone. If you have ever asked me for a pen recommendation, the first response you received from me is “What will you be using the pen for?”, that is, if you haven’t laid it out for me already. It is an important question because I want to help you find the best pen for the best situation. Not all pens are created equal! This Tikky Rollerpoint is one of the most impressive pens I have ever had the pleasure of holding. The weight and feel of the barrel are phenomenal and you can tell by holding it that a lot of thought went in to the design. The needle tip is extremely firm as well. Where I found the pen getting off track was in the ink flow department. It flows fast and I had to pick up the writing pace to keep ahead of the ink bleeding. For me, it doesn’t fit my style of writing. The output does look impressive on the page though. Where I see this pen fitting in is with a long form writing style. If you are a cursive note taker or journaler who knocks out several pages in one sitting I would recommend taking a look at this pen. It reminds me of the Pilot V7, which is one of the best needle tip liquid ink pens on the market. If you are more of a stop and start, detailed note taker like me, then you may want to look at a gel ink needle tip pen. Pen choices are nearly endless. Be sure to take the time to understand the pros and cons of each pen and how it would apply to your situation. Your next favorite pen is out there somewhere. 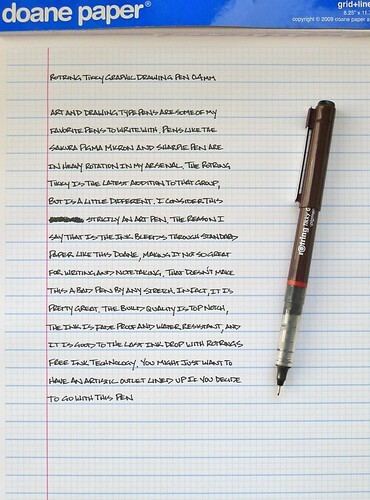 Posted on February 15, 2012 by Brad Dowdy and filed under Pen Reviews, Rollerball, Rotring, Tikky. A recurring theme for the past few months has been my newfound love for all things Rotring. It’s not that the love wasn’t there before, it’s that the availability and accessibility to the product is much greater now. One can argue that today’s Rotring (as part of the Newell Rubbermaid conglomerate) is a much different product than it was in the past, but my focus is on the present. How do Rotring’s current products compare to other similar products on the market? The first word that comes to mind is expensively. If you have compared a Rotring pen or pencil to another comparable pen or pencil then your know what I mean. Rotring products are more expensive, usually around two times as much as similar products. But are they a good value? That is the more important question. The Rotring Tikky Liner is a good pen, but I would hesitate to call it a good value. The design is beautiful, the feel is great, and when the ink flow gets going it is a great writer. Open up the original size photo in Flickr and you will see what I mean. I love how it performs - when it performs. That is the problem with the Tikky Liner. I am finding the ink cartridge to be very fussy and frustrating. It is widely know that the Pilot Hi-Tec-C needs a little warm up before heading off to the races. Two or three seconds of scribbling and it is ready to go for as long as you are. With the Tikky Liner, two or three minutes often wasn’t enough to get the ink flowing. If a pen is going to cost this much the frustration level needs to be a lot lower. I can’t help but reach for it at least once a week, but more times than not I am reaching for a different pen within a few minutes. 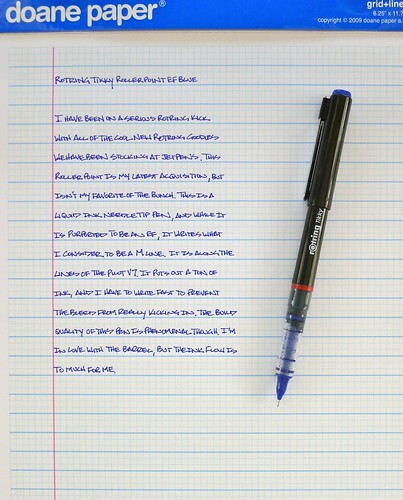 Posted on January 16, 2012 by Brad Dowdy and filed under Pen Reviews, Rotring, Tikky. Rotring makes some of the best looking pens on the market. I am a big fan of the high quality construction and clean design. Yes, you do pay a premium for them compared to other similar pens on the market, but in most cases I think it is worth it. The Rotring Tikky Graphic Drawing Pen is a relatively new item at JetPens. It had been requested a few times by artists and art students because of its durability. I certainly don’t put these pens through the rigors and stress that an artists does, so I take their word when they say how durable the tip of the pen is. Like your favorite coffee, they are good down to the last drop of ink. I use this pen mostly for writing. My lettering looks amazing, but since the ink flows so fast and heavy it tends to bleed through regular weight paper like the Doane Writing Pad I use for reviews. Compared to the Sakura Pigma Micron, the Rotring Tikky is a true artists pen, made to be used on heavier weight sketch paper. I can get away with simple note taking with the Micron where I can’t with the Tikky. There are always so many different things to consider when purchasing a pen. 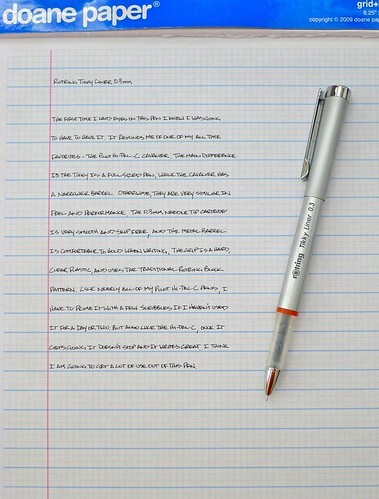 If you are a writer this pen might not be for you. But if you are an artist this might be your new favorite pen. Posted on December 14, 2011 by Brad Dowdy and filed under Doane Paper, Drawing Pen, Pen Reviews, Rotring, Sakura Pigma Micron, Tikky.